Spaces for Kids on the Santa Cruz II: An Amazing Galapagos Trip! BlogHome » Blog » What types of spaces are available for kids on the Santa Cruz II? Due to the incredibly unique and rare wildlife that they are home to, the Galapagos Islands remain at the top of many people’s bucket lists. The Enchanted Isles also happen to be a wonderful place for a family vacation, where both adults and kids can have an amazing and fun time while exploring the archipelago. The best way to go about experiencing the islands? Aboard an Expedition Vessel, of course! In this blog, we invite you to have a look at the wonderful spaces for kids that we have available on the Santa Cruz II! This should give you a good sense of what to expect if you’re planning to bring your whole family along for the adventure. Aboard the Santa Cruz II, we are well-equipped to fulfill virtually every need that our guests might have. We also have many comfortable communal areas aboard our vessel, specifically created to allow our guests to socialize or dabble in a little bit of relaxation. One of the most popular spaces on the Santa Cruz II is the library! This is a big room with plenty of space to accommodate larger groups. It has a wide selection of books, including some interesting options for our younger explorers. It also has a snack and coffee station for those looking to enjoy a warm beverage or something sweet to nibble on. There are big and comfortable couches for guests to stretch out on, relax, read a book or enjoy documentaries that we display on our flat screen TV or the projector. The library is located on the Expedition deck, towards the bow, so it has a breathtaking view of the spectacular views outside! This large room also functions as our gathering point before we head out on our daily excursions. Guests are invited to meet up at the library for a last, short briefing and headcount before venturing out to the islands. The library makes for one of the largest spaces for Kids on the Santa Cruz II! Another one of our popular spaces for kids on the Santa Cruz II – and perhaps the most entertaining spaces for our little explorers – is the Discovery Room. This space for kids aboard the Santa Cruz II is a somewhat smaller room (when compared to the Library), but it’s much more intimate, quiet and most importantly – filled with entertainment! Here, you will be able to find a number of different board games for all ages! We have chess boards, checkers, chutes and ladders, puzzles and even blocks for smaller kids. The Discovery Room is a space for kids that serves as the ultimate entertainment center! This space also comes equipped with its own flat screen TV and a generous selection of blu-ray and DVD movies. We’re sure kids will find a movie, animated film or documentary that’ll suit their mood! The space provides plenty of entertainment and games for kids to enjoy their time aboard the Santa Cruz II! Parents, too, can easily keep a watchful eye on their little ones, as this room has a large window that looks into the space from the outside (so there’s no need to step inside the Discovery room to check out and see what the kids are up to!). The Discovery Room is located right in the middle of the Expedition deck, just a few steps away from the the Library. The hot tub area is one of our guest’s top picks for hanging out and relaxing! 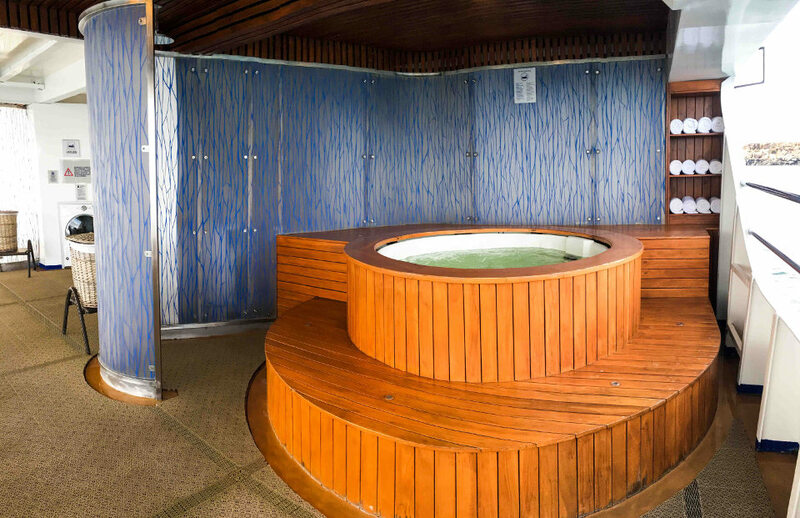 Our two fully-equipped hot tubs are located at the stern of the boat, right on the Expedition deck. Guests can adjust the water temperature to warm or even lukewarm. Our recommendation is that you make it slightly warmer than the oceanic temperature so that the kids can have a great and comfortable time! You don’t need to make it boiling hot! Our hot tubs have become very popular and soothing pit stops for our guests, particularly after our snorkeling adventures. Normally, our guests will come on board, place their equipment in the designated place, head up the steps and jump right into the hot tubs. Warming up has never been more fun! We also have two clothes dryers right next to the hot tubs, available for all of our guests to use. Spaces for Kids on the Santa Cruz II: There’s Something for Everyone! As you can see, we have various facilities aboard our Santa Cruz II that are sure to keep the entire family entertained and comfortable! We never fail to pay special attention to the needs and desires of our guests, always making sure that they all have a great experience during their leisure time aboard the Santa Cruz II! previous post: Galapagos Land Birds during the First Rains of Hot Season: Birders Get Ready! next post: Which Galapagos cruise offers an onboard Expedition Photographer?